We are rested up and ready to begin our second day in Dublin with some natural beauty. 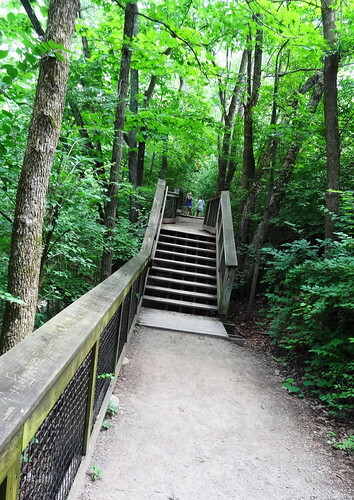 This area of Ohio is home to ravines, steep cliffs and numerous tributaries of the Scioto River; elevations range from 780′ above sea level where we are, to a high point of 1,000 ft at Glacier Ridge Metro Park. 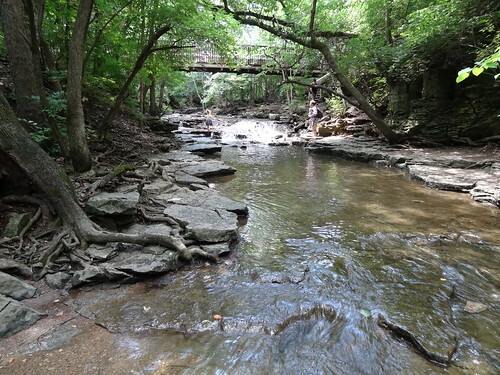 The car is parked in the small lot at Indian Run Falls; we head out on a dirt trail that runs along Indian Run Gorge, wooden steps lead to a boardwalk, then back to a dirt path, up, down, around curves, we follow other visitors down to a shallow spot in the river. We have an up-close view of water that cascades beautifully over rugged limestone, I love the sound of the water as it rejoins the river. Families traverse the rocky riverbed, children splash, grown men test their balance as they straddle the rocks. 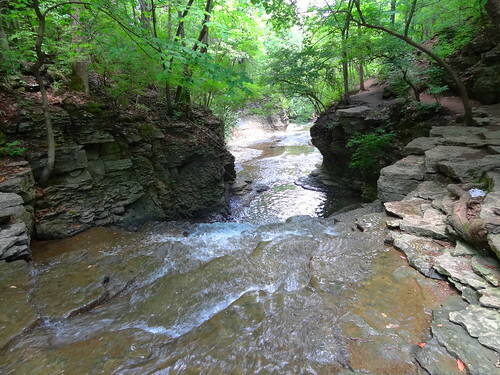 We climb back up to the trail and continue to follow the rim of the ravine; water moves swiftly, trees cling to the shoreline, exposed roots grip jagged limestone. There are overlooks and places to sit with a panoramic view. 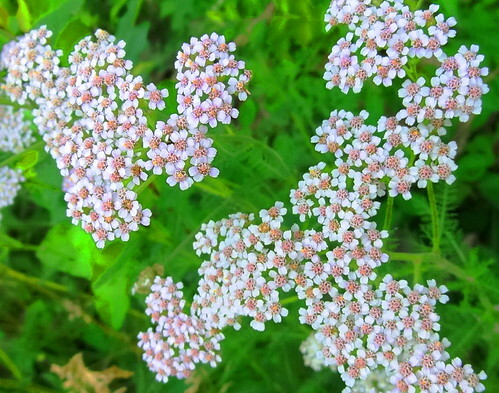 The habitat here is unique to the gorge, some rare plants can only be found on the west shore of the river, many species of birds live here too. 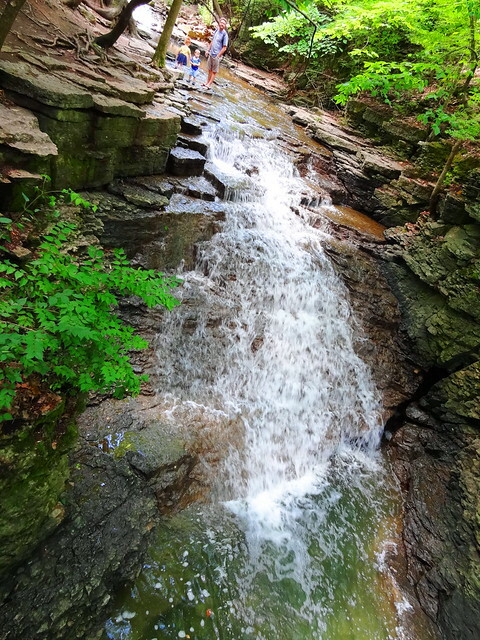 The sound of water grows louder, we look out over the waterfall and gorge below. A group of girls have attracted a bit of an audience as they stand on the edge of the falls, one at a time they take a deep breath and leap into the deep pool; I’m too chicken to do it myself but it sure looks like fun! We re-trace our steps, it’s nice and cool in the shade. I feel far removed from the city; here in the park it’s hard to remember you’re right between Dublin and Columbus. Who wants ice cream? I do! In a few short minutes we are back in historic Dublin, Jeni’s Splendid Ice Cream has a shop on Bridge Street, let’s go. Kris and I have been eating Jeni’s ice cream for many, many years. 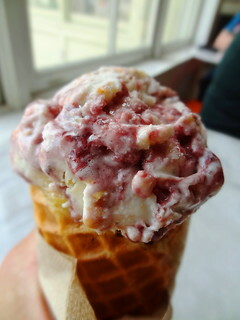 Our first scoop came from North Market in Columbus when Jeni herself was behind the counter scooping ice cream. 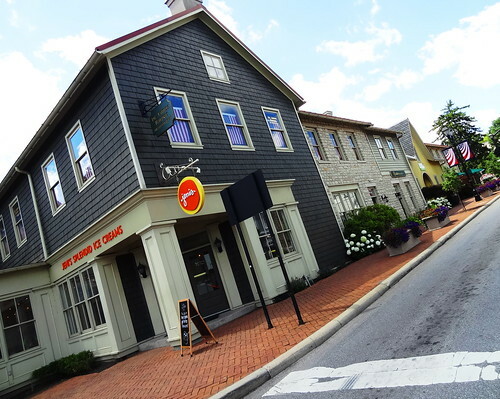 Her exceptional quality, unique flavors and friendly employees continue to draw us in. Taste as many flavors as you like, seriously, they actually encourage it. 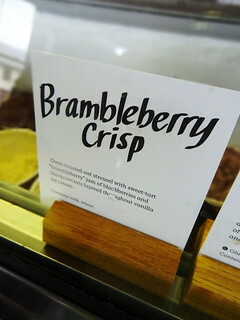 Kris is in luck, they have his long-time favorite Brambleberry Crisp, a generous scoop fills the waffle cone. For me it’s a scoop of Salted Peanut Butter with Chocolate Flecks, a triangular piece of waffle cone decorates the top. DELICIOUS. 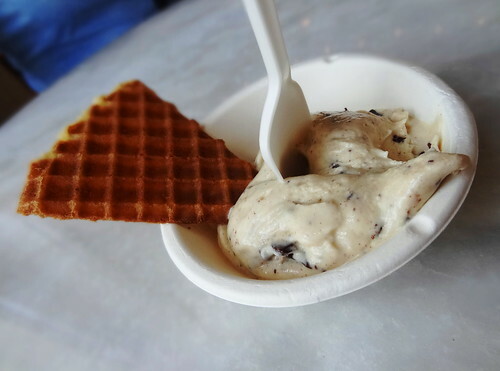 So creamy, so flavorful; this is why we love Jeni’s. Our time is running short, we have one more stop to make before heading north. 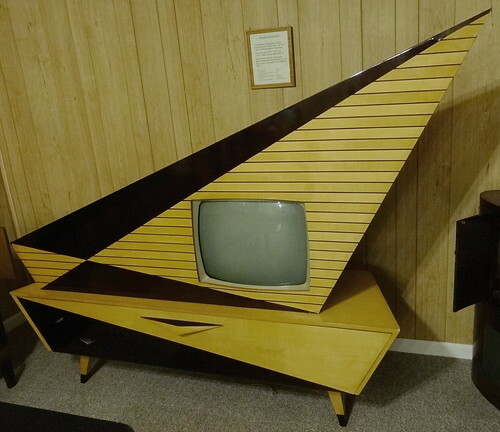 Tucked away in Hilliard Ohio is the Early Television Museum. 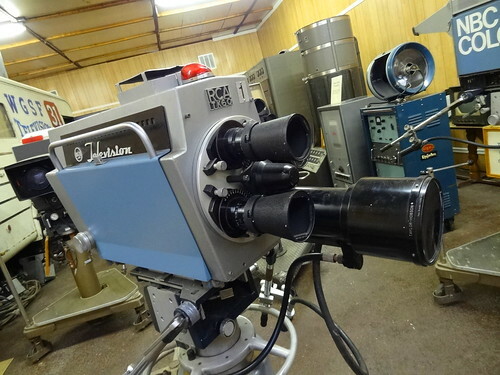 This non-profit institution is dedicated to the preservation of early television technology. Housed in a 4,200 sq. ft. building they have over 150 TV sets on display, this is one of those super-cool, must-see, off-the-beaten-path places; put in on your list of things-to-do-in-Ohio. The nondescript exterior provides no clue to the awesomeness awaiting inside. 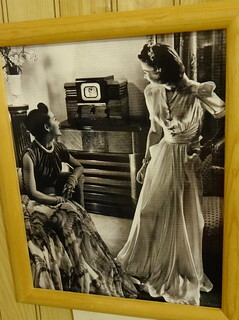 Displays begin at the beginning of television, those very early days of mechanical TV’s from the 1920’s and 30’s. There is a great deal of technical information posted on the walls–most of it goes right over my head, I read it anyways, fascinated by the idea of it all. The first television sets developed by John Logie Baird in England and Charles Jenkins in the US were mechanical, this was in the 1920’s, at that time TV screens were only an inch or so wide with poor picture quality. 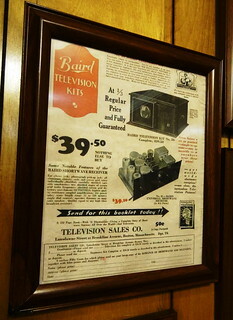 By 1930 television was being broadcast from over a dozen stations in the US, at that time manufacturers started selling TV sets and kits you could assemble yourself. In those days everything was about beauty, just look at these early TV’s, the consoles are large, made of fine wood with beautiful finishes, they were equal to the quality of your other home furnishings. Screens were teeny tiny in the beginning, some sets opened from the top, a mirror mounted to the underside of the lid reflected the image from the TV screen. In the early days radios and TV’s were combined into one unit, some even came with a phonograph providing a total entertainment system! Look at these beautiful consoles with their gauges, dials, buttons. 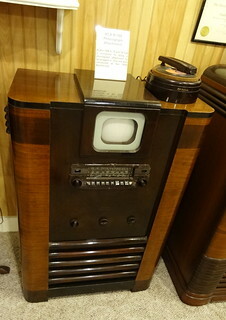 The Art Deco style was big in early TV design, I love the streamlined shape and designs. Placards often include terms such as lamps, bulbs and tubes, words we don’t associate with televisions in 2017. 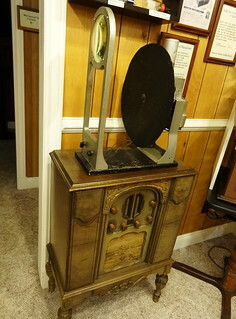 Early manufacturers include Murphy, Mercier, Baird, hey, there’s the little dog with the gramophone, it must be an RCA. Visitors can operate some of the pre-war, post-war and early color sets using push buttons throughout the museum. We try a couple out, we are so spoiled by today’s technology, these screens are so small, the picture quality is poor, but in its day it was spectacular. 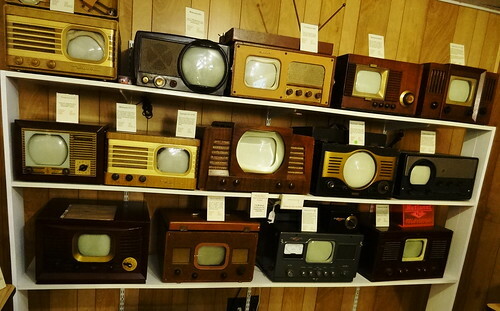 The collection includes televisions from the 20’s and 30’s, British sets, pre 1945 American sets, post-war sets and early color sets from 1953-57–many in working condition. We wander from room to room, paneled walls are cloaked in frames containing information on specific brands, sets, advertisements and vintage photographs. 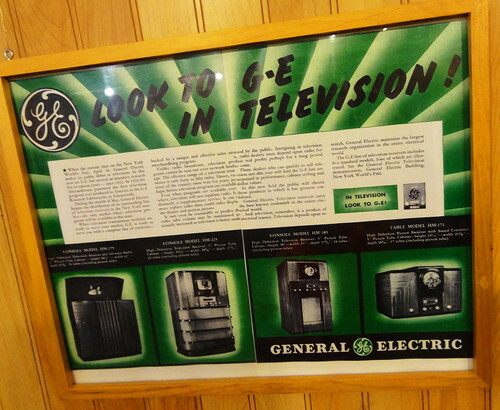 Names are more familiar as we move through the years: Zenith, Fisher, GE, Philco, Admiral, Motorola, RCA. There are displays of signal boosters, portable TV’s, picture tubes. There are table-top units and floor consoles with panels that open, slide and tilt. Materials reflect the period they were manufactured. 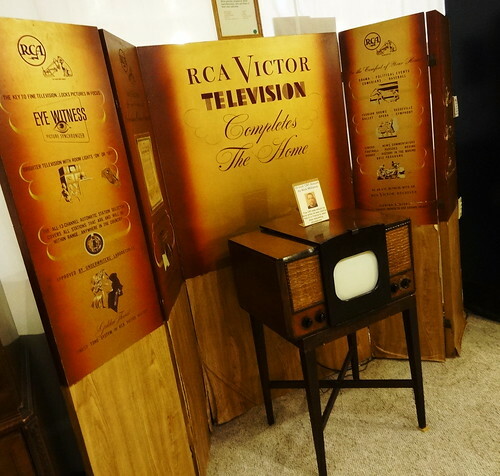 We pore over great advertisements, promotional items, light-up signs and fabulous floor displays–my favorite is the RCA Victor store display. 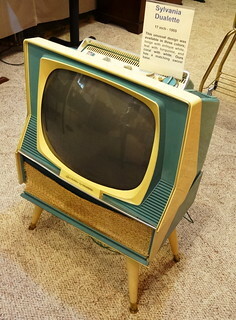 The Sylvania Dualette 17″ TV from 1959 is probably Kris’s favorite; the funky shape, blue and white plastic housing and those legs… awesome. 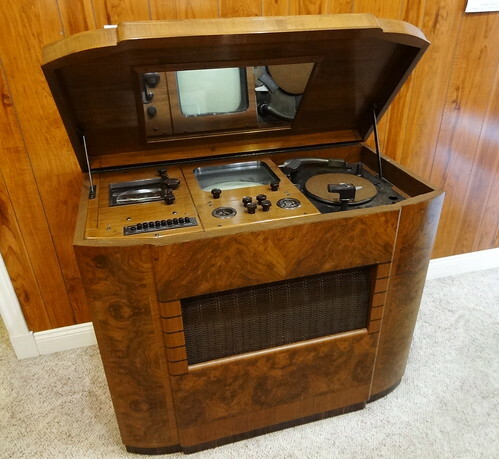 I get up close to a large unit to see what it is, in 1964 Seeburg and Emerson came together to make the Telejuke, you guessed it, a 15″ screen TV and jukebox combination to be sold to bars. 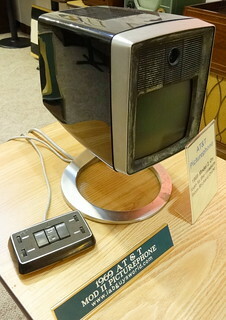 In those days TV stations objected to “pay TV ” which probably halted the production of them, very few were sold, it’s quite a thing to see… We recognize more of the brands and styles as we progress through time, I have to admit, I’ve never seen anything like the 1969 AT&T MOD II Picturephone. A small section houses foreign TV sets, Kris and I agree the wild, modern set from Germany is the best of the bunch. 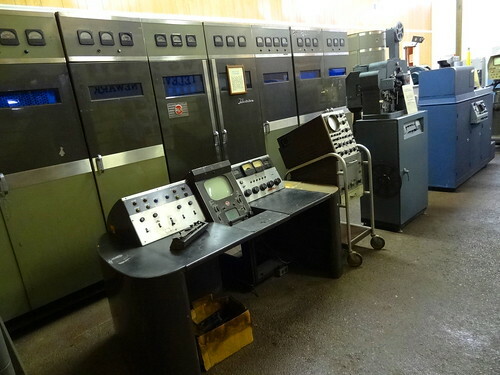 The last section of the museum is dedicated to early TV studio equipment. 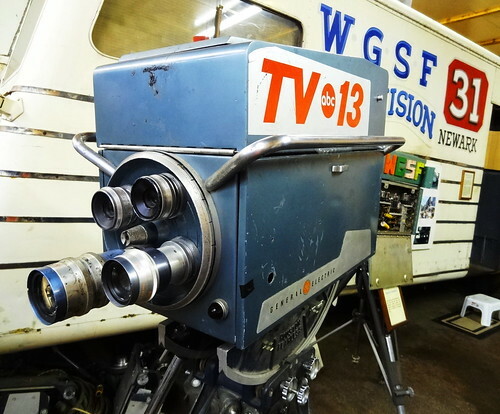 You can see your friends as they would have appeared on mechanical TV in 1930, there’s a working 60 line flying spot scanner TV camera, a television transmitter and a cool old TV news truck. There’s a ton of equipment, monitors, cabinets with screens and gauges, very impressive. The Early Television Foundation was founded by Steve McVoy. 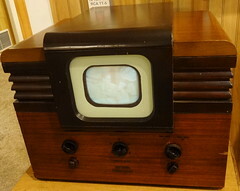 As a teenager he worked in a television repair shop after school, and sometimes worked on 1940’s sets such as the RCA 630. 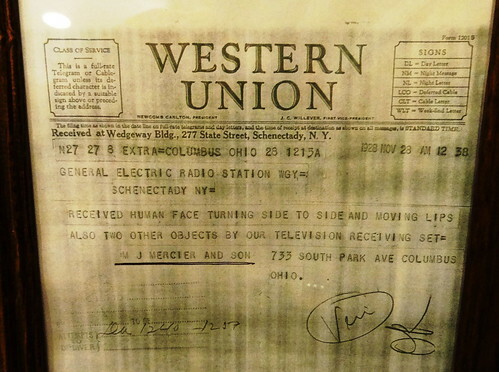 In 1999 he sold his cable television business, was looking for something to do with his time, and decided to collect early television receivers. As his collection grew, he began to run out of space to display it. He then came up with the idea of starting a museum so he would have a place to put his growing collection and the public could easily view it. We’re so glad he did! BTW, the Detroit Derby Girls had a victorious evening!